Chart your course with the "Tracker" compass. Let our best-valued wooden case compass guide you in the right direction. We can print any PMS color for no additional charge if not an exact match. 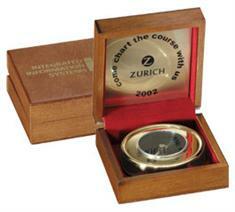 Featuring a wood pine-color display box, our gold toned Compass makes a great Business Gift!